In his first full NHL season, Ryan Hartman has established himself as a gritty, versatile competitor, a player whose love for the game is readily apparent from the moment he starts talking hockey. Mention the video feature the 22-year-old Hartman – along with Chicago Blackhawks teammate Scott Darling – recently took part in, the one that sees the duo meeting kids throughout the Windy City and playing hockey in a variety of settings, and it’s obvious there was no arm-twisting to get him on board. Born in Hilton Head Island, South Carolina, and raised in West Dundee, Illinois, Hartman and his younger brother spent countless hours playing hockey wherever and whenever they could. The siblings also managed to leave their mark on occasion. The message didn’t quite get through. When the boys weren’t busy honing their skills and disrupting home repair, they would often make the short trek to a local spot for more hockey time. 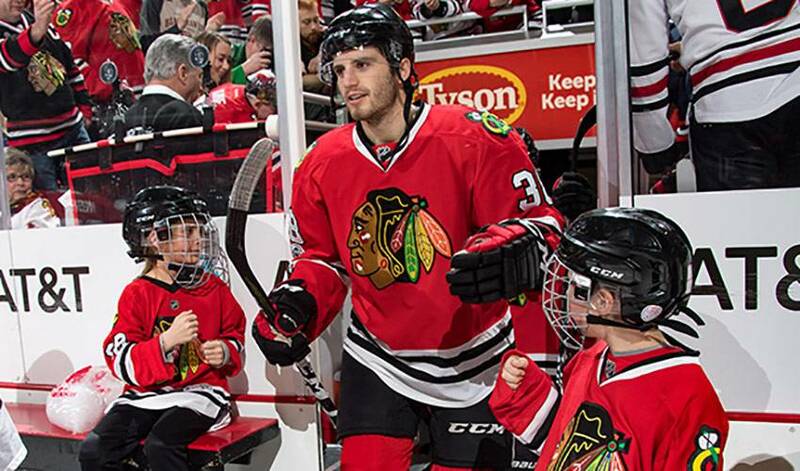 The former 30th overall pick in the 2013 Entry Draft has been a significant contributor to a Chicago team – the team he cheered for as a kid – currently sitting atop the Western Conference standings. Hartman, two tallies shy of 20 goals on the campaign, has stamped himself as the type who will go to the wall for his teammates and put others through it. Hartman is at ease wherever he happens to be. “It’s kind of how I’ve always played, bouncing around different lines, being put in different situations – penalty kill, power play – so when you have that support coming from your teammates, it’s a good feeling,” he said. “To be part of the team for the whole year, being around it the whole season and being able to contribute, really helps you feel comfortable. And it’s just as much fun as the days of banging a ball around in the basement with his brother. “That’s where the creativity comes for hockey players, just messing around and playing every day,” offered Hartman.